Balcombe: renewal of an important garden and arboretum. 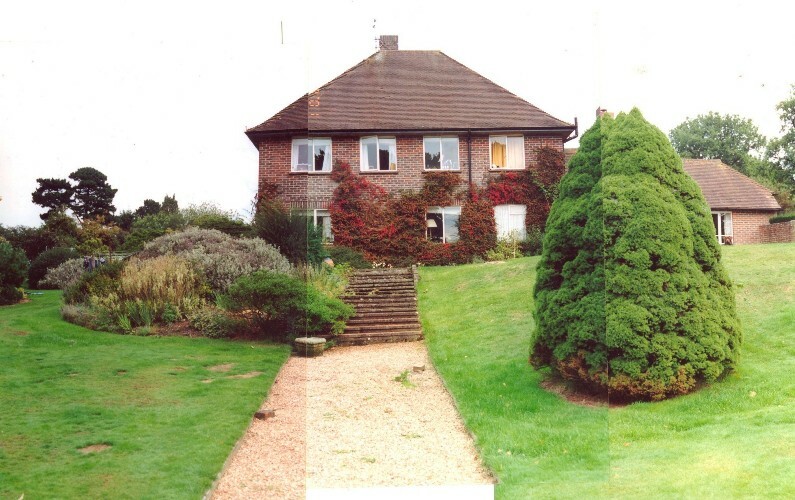 There had earlier been a very grand house here on the Sussex High Weald, but it had been demolished and a much smaller house had been built on the site in the years around the Second World War. In a reversal of the more usual way of things, the large garden had survived, although it was somewhat neglected and overgrown. In particular, there was a significant arboretum, where a number of rare and important acid-loving specimen trees were doing their best to survive amidst the green chaos. The new owners determined to build on to the existing house to create something much more in keeping with the plot. 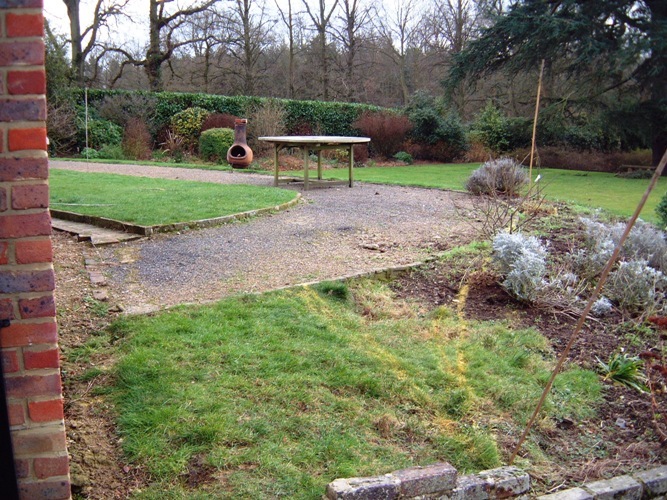 They were also very keen to restore the garden, whilst adapting it to suit a modern lifestyle. Lovely, Lovely, Lovely was engaged to provide consultancy and design input to this process. We helped our clients to develop their ideas, including translating the complex, old pattern of paths and borders into a fresh layout that worked in the new context. It was important to preserve the old features, but it was equally important to join them seamlessly to the new, so that the garden would flow easily. Our clients shared an excellent sense of design and expert knowledge of plants, so we adopted a collaborative approach that made productive use of brainstorming, with excellent ideas coming quickly and being refined later. With this advantage, we needed to produce little more than sketches to capture the agreed design. To prove the design and to aid the work of those implementing the changes, we used spray markers to set-out the new layout directly on to the ground on site. To support the recovery of the arboretum, we surveyed it thoroughly to identify each of the specimen trees. We then planned long-term care for each individual important tree, taking careful account of the marked effects of the acid soil on the particular species and cultivars. As the creation of the garden advanced, we also selected and supplied plants and attended short review sessions with the clients to resolve concerns or to give advice about specific developments or particular plants. A bonus of the collaborative style of working was that we were able also to produce sketches and drawings that informed the clients’ design choices about shape, form and extents of the developed building, including the conservatory. The end result is a harmonious integration of house and garden. In place of the earlier, prosaic, four-square look, this elevation now has a pleasing shape that sits naturally with the lie of the land. The design of the deck helps to offset the bulk of the building, giving it a longer, lower look. The new beds balance the old and dress the house beautifully. Before: view from the garden. A key consideration was to overcome the asymmetry of the existing flower beds. The good formal steps were attractive and in good condition, so we resolved to incorporate them into the new design. 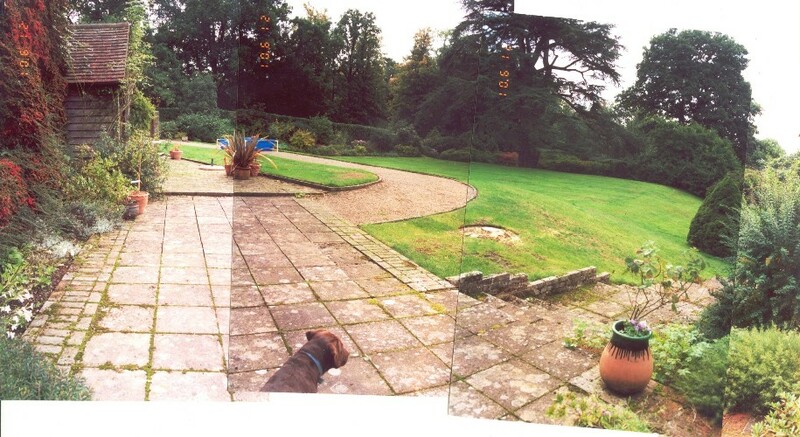 The new extensions sever the old connections between pathways and fragment the original lawn. Here one can just see the sprayed markings that allowed us quickly and practically to prove the design. Before: view from the terrace. This gives a good sense of the dramatic potential of the garden, but the terrace looks tired and the overall look is threadbare. We designed the new terrace to flow around the house, wrapping it sumptuously in plants and flowers. The style of the balustrade was chosen to complement the style of the house, whilst allowing unhindered views of the elegant, sweeping garden beyond. The old and new borders seen from the deck give no clue that they are of vastlydifferent ages. Dressing the large terrace with soft, colourful architecturalborders creates a desirable illusion of intimacy. We selected quick-growingshrubs to avoid “new border syndrome” and to ensure that the requiredbalance could be achieved as early as possible. Almost the only remaining architectural feature of the previous grand house isthis arch, an isolated and underused delight. 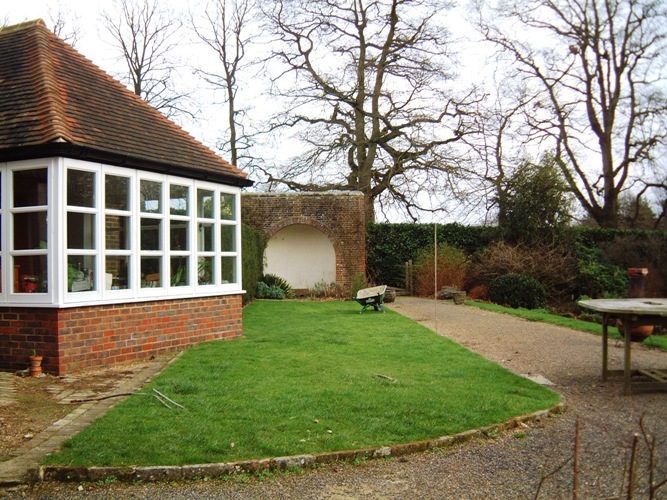 The new extension cuts across thelawn so careful tying together of the old and new is needed to achieve aharmonious and flowing layout for the garden. We trimmed back the lawn at the edge where the new extension intersects withit. 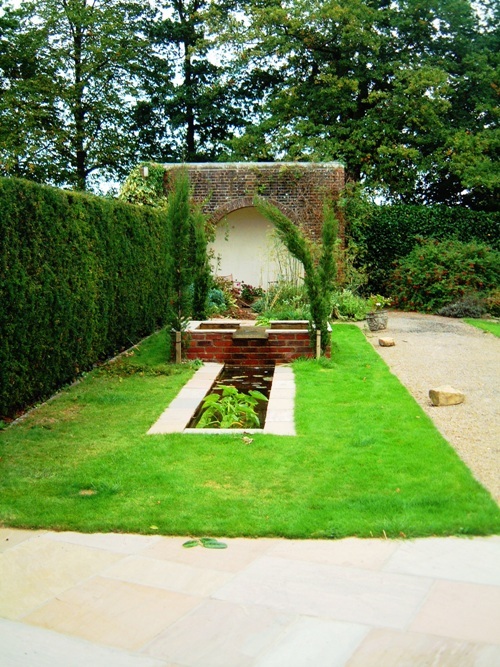 We incorporated a rill with a raised mid-section to make a formal pond. Therill lends a new purpose and meaning to the old arched niche, allowing visitorsto enjoy the view and the gentle sound of the water from within itsshelter. The front porch: another example of the fruits of collaboration. 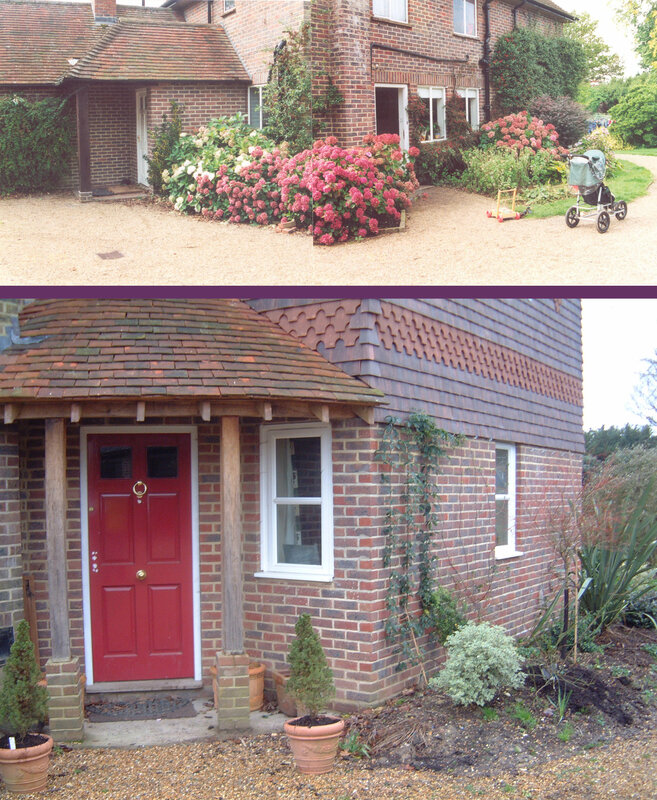 The clients were delighted when we suggested that as part of their buildingprogram they might redesign the porch. Setting the door at this angle and usinga softer, curved roof arrangement makes this elevation much more appealing andpresents the door imposingly on the main line of approach. And, internally, theextra space resolved some difficulties of access.